China is setting up its second ever overseas military base in Afghanistan in order to train Afghan brigades in counterterrorism efforts, as well as attending multilateral discussions alongside Pakistan at the heart of Kabul to talk trade and security. Why this sudden interest in such a long-winded conflict, for a world power that has been relatively uninterested in other nations’ unrelated political affairs? China’s priorities seem to come down to the Belt and Road Initiative (BRI), China’s new umbrella moniker for a series of economic and infrastructural projects throughout the world. Central and Western Asia has received a great deal of attention from the BRI, as China attempts to further strategic and soft power interests through gaining new outlets for overland and maritime trade in the region. Skeptics point out that impassable regional dynamics and chronic insecurity may foil China’s attempts at linking Afghanistan and parts of Pakistan to its greater BRI web. These days, China has seemed to agree with that analysis, stepping out into the peace process and attempting to try its hand at mediation and arbitration between the powers locked in struggle in Afghanistan. China’s increasing dependence on its Westernmost provinces to serve as key industrial hubs for BRI and other economic development ventures means that China has a lower tolerance for instability in said provinces and neighboring states. This article will catch you up on China’s new role in Afghanistan through the lens of its BRI priorities and the historical ties between China and Pakistan, Pakistan and Afghanistan, and China and Afghanistan. In the pre-Xi era of Chinese foreign policy, China’s foreign involvement toed the line of non-interference in other countries’ affairs. Hu Jintao, the general secretary of the Chinese Communist Party before Xi, had been extremely “risk-averse,” and so the dynamism that has defined China’s economic performance in those years had yet to extend to China’s foreign policy. In short, BRI plans to economically consolidate China, Central and Western Asia, Russia, Southeast Asia and Europe with multi-billion dollar infrastructural linkages that give China alternative land and sea routes for movement and trade. Before BRI and related initiatives, the only way for China to access Middle East-exported energy sources were by routes running through the Strait of Malacca, a physical bottleneck heavily patrolled by the United States and other Eastern and Southeastern Asian powers. So, strategically speaking, BRI can provide China access to energy on its own terms and in a more efficient manner, while opening up brand new consumer markets via land and sea for Chinese manufactured goods. BRI, as the name suggests, encompasses a “Belt” — a land portion running the route of the ancient Silk Road from China’s Westernmost provinces across Asia and into Europe” — and a “Road” — a maritime road based off of the expansion of Pakistan’s Gwadar port and other pipelines into Southeast Asia. But even nearby China there exist regional hotspots of ongoing political conflict and violence. China has been increasingly concerned about instability in its Westernmost regions, as well as its Western neighbor Afghanistan. This behavior has manifested in several new initiatives in the name of internal security, such as the horrific treatment of Uighurs, the Muslim Chinese minority primarily based out of Xinjiang province. Ultimately, the China-Pakistan-Afghanistan triangle has some interesting historical implications that affect the situation today — so let’s take a look at how those relationships have evolved over time, first. The Taliban, with branches based in Afghanistan and Pakistan, has long been a thorn in the side of South Asian, Central Asian, and Chinese security. The potential for the Taliban to endanger Chinese interests and endeavors only grows alongside the scale of Chinese projects in Central Asia. China thus far has not escaped spillover strains on its own security from radical elements in Afghanistan and Pakistan. China has also accused the Taliban of harboring or training members of the Eastern Turkistan Islamic Movement (ETIM) and thus indirectly supporting ETIM’s multiple terrorist attacks in China. Security issues in Afghanistan have generally become more pressing as projects have expanded, but China’s best friend in the region — Pakistan — may have different end goals in mind for Afghanistan than China does. China and Pakistan as Best Buddies? China and Pakistan both call their friendship “all-weather.” China often comes to Pakistan’s defense as a staunch ally when Pakistan faces international pressure. However, there have been occasions during which China has deviated from this norm, at a time when the U.S. and Pakistan were similarly struggling to patch up relations: the May operation to kill Al-Qai’dah leader Osama Bin Laden, during which the U.S. sent troops deep into Pakistan without the Pakistani government’s knowledge or permission. Ordinarily, China would have leapt to the defense of Pakistan and decried the U.S.’s intrusion into Pakistani sovereignty, and to a certain extent, government officials did warn the U.S. about the importance of respecting Pakistani authority over affairs of internal security. At the same time, however, the fact that Bin Laden had been tracked down in Abottabad “reinforced fears among Chinese officials about extremist sympathies in the Pakistani military,” wrote Andrew Small in his book The China-Pakistan axis. “The Pakistanis were told that while they could continue to count on China’s regular economic and military support, […] Islamabad urgently needed to patch up its relationship with Washington.” The Chinese government for perhaps the first time showed itself willing to split thoroughly from the position of the Pakistani government. Changes to the China-Pakistan relationship have been motivated by the aforementioned increase in attention to China’s Western areas, accelerating the need for better security there. China looks upon Pakistan’s role in fomenting unrest very uneasily. Particularly during critical diplomatic visits from Pakistan, China and especially its Westernmost regions have been subject to attacks by Uighur separatists and, China alleges, members of ETIM: the most shocking attack in 2014 involved the fatal stabbings of 29 people in a Kunming railway station. China blamed radical elements in Pakistan, particularly in north Waziristan and the Federally Administered Tribal Areas (FATA) for spreading propaganda and encouraging radical Islamist separatism among its Uighur population. After pressuring Pakistan, the Pakistani army enacted a devastating military operation in North Waziristan. The China-Pakistan Economic Corridor (CPEC) also promises to change China-Pakistan relations permanently. CPEC is the biggest project under the BRI banner, involving a $54 billion investment directly into Pakistani infrastructure and energy generation projects. China has started working on developing new roads and railroads running from the north of Pakistan down to major port cities Karachi and Baluchistan province’s Gwadar. The Chinese government intends to make use of Gwadar port as a key stop in the route of energy transportation from the Middle East to Western China, and the new road promises new life for Pakistani manufacturing and commerce. However, sources have noted that these endeavors in Pakistan also take on a great deal of security risk due to the instability emanating from Taliban-aligned areas and other extremist factions. As China infuses Pakistan with more of its money for CPEC projects, China will also be scrutinizing issues of security and ensuring that the Afghan conflict does not negatively impact any Chinese investments. It would be a mistake to characterize the Chinese-Pakistani partnership as equal. China wields an enormous among of influence over Pakistani affairs and controls the agenda of what the bilateral relationship entails. Pakistan and Afghanistan: A highly leveraged relationship? The relationship between Afghanistan and Pakistan is mostly defined through tensions between Pakistan and India. Pakistan’s fear toward India’s growing influence and regional power has motivated it to incentivize insecurity in Afghanistan to try and shape the outcome of peace talks, prolong military involvement, or create the conditions for further U.S. drawdown. These fears outweigh Pakistan’s simultaneous desire to clamp down on the Tehrik-i-Taliban, the Pakistan-based branch of the Taliban, especially if the Taliban in Afghanistan ends up becoming a negotiating party during peace talks later on. Pakistan’s tactics for ascertaining influence in Afghanistan work against Pakistani desires for internal state stability, as instability and conflict in Afghanistan inevitably spills over into surrounding states. Throughout history, Pakistan and the Taliban have been inexorably linked. Pakistan’s ISI in the 70’s and 80’s deepened their relationship with Pakistani and Afghan fundamentalist Islamist groups. The Afghan Taliban in 1994 primarily recruited out of the exiled Afghans that had studied in small Pakistani religious schools. However, because Pakistan has established such robust ties with the insurgent groups in Afghanistan, there now exist avenues for Pakistan to leverage them in the Afghan government’s favor. Likewise, integrating the Taliban further into the political mainstream and giving the group a seat at the table in peace talks would be the best outcome for Pakistan. Afghanistan has tolerated Pakistan’s meddling out of desire for Pakistan to one day pressure the radical groups to come to the negotiating table. China and Afghanistan: making new friends? At the same time, the Chinese government did not want a U.S. victory resulting in a long-term Western presence in such close proximity to China, or a fully pro-U.S. government installed in Kabul. In 2007, China began investment and development activities in the huge mineral deposits within Afghanistan, particularly in the large Aynak copper mine. The rich landscape of natural resources in Afghanistan created increasingly attractive opportunities for other areas of Chinese investment, and some Chinese private enterprises got involved with developing other sectors in Afghanistan, such as the oil industry. Chinese construction companies also got to work on some infrastructural repairs, such as sections of the ring road in Faryab province, as well as hospitals in Kabul and Kandahar and an irrigation project originally begun in the 1960’s. In 2011, China began to pay more attention to conflict-side issues, because the ominous date of 2014 was announced as when Americans were going to leave Afghanistan entirely, and China wanted to make sure it had a seat at the table to influence the next stage of Afghan politics, whatever they might be. The most defining characteristic of the China-Afghanistan relationship, however, remains the relationship that China has had with the Taliban. China and the Taliban: not the likeliest of bedfellows? In “one of the most important clandestine operations in the PRC’s history,” China began to supply arms to insurgent groups in Afghanistan against the USSR, out of its desire not to have a Soviet bastion along one of its immediate borders. However, China had also “never been enthusiastic” about the Taliban’s rise, as the fundamentalist and incendiary quality of the group would not be ideal if they took hold in China’s Westernmost regions. A Pakistani diplomat has also been quoted as having encouraged Chinese officials to establish connections with the Taliban. In February 1999, five Chinese diplomats flew to Kabul to meet with Taliban officials, and as a result, China and the Taliban announced the inception of a trade relationship, flights between Urumqi and Kabul, and some food aid for Afghan citizens. China’s diplomatic warming to the Taliban regime and was measured, but they never stood up for the Taliban in a meaningful way in the international circuit, such as vetoing new sets of UN sanctions or an arms embargo. Instead, China abstained from the vote, expressing worry for the suffering of common Afghan citizens under the measures. The Taliban and their representatives in Pakistan hoped that China would extend diplomatic recognition, but China held back from doing so, and later alongside other Asian nations issued grave statements about the desecration of several key Buddhist landmarks under the Taliban. Later, it remained an open question as to whether China was making secret agreements with the Taliban. Chinese road projects, which stretched through several tightly Taliban-controlled areas, were allowed to proceed remarkably unbothered by extremist forces. Chinese leaders have also been able to gain agreements from the Taliban at key security junctures, such as the Taliban’s promising that Uighur separatists could not use Afghanistan for military training. The fact that China has been the only country besides Pakistan to maintain speaking terms with the Taliban’s leadership could be a valuable diplomatic tool, especially when it is now apparent that the only way forward is a diplomatic resolution of the Afghan conflict. However, other Chinese officials have quickly pointed out that discussions with the Taliban have been nothing more than “contacts,” and were essentially about allaying fears of Taliban infiltration into Xinjiang. The Taliban quietly expressed their support for the idea of Chinese involvement, if only due to their perception of Pakistan’s “overbearing” influence over the Taliban and the potential for China to alleviate some of that pressure. Ultimately, China’s relationship with the Taliban has remained far more constructive than that of the U.S. and the Taliban, with China being able to negotiate certain concessions out of the Taliban in exchange for accomplishing its regional goals. As China’s power grows, the Chinese government could leverage these connections in order to bring the Taliban to the negotiating table and restart the peace process. China’s growing forcefulness in the Afghan peace process — what makes it such an effective actor? The U.S. has gone back and forth from wanting a total military solution to entertaining ideas of a diplomatic agreement with the Taliban in Afghanistan. While reportedly, President Bush refused a 2002 offer of surrender from the Taliban, the Obama administration supported the Afghan government in creating avenues for peace talks to occur, even encouraging the opening of the Taliban’s public-facing offices in Qatar. President Trump has only given his verbal support of peace talks insofar as the accompany the accomplishment of further military goals — a fairly contradictory stance on the matter — but within his administration, former Secretary of State Rex Tillerson indicated his support of peace talks with the Taliban. China has been involved in peace talks in earnest only recently, creating new avenues for interaction and trust-building between Afghanistan, Pakistan, and the Taliban. The acceleration of these initiatives coincides with the shifting of China’s strategic objectives with the inauguration of the BRI. In January 2018, the Taliban contacted representatives from the Afghan government, along with Pakistan, China, and Qatar, about the prospect of re-opening peace talks. This last June, the Afghan government and the Taliban were able to agree on a limited ceasefire over the course of the first three days of Eid-al-Fitr. Unnamed Pakistani officials referenced in media reports stated that Pakistan and China played key roles as guarantors of the ceasefire deal. China is now reportedly building a military base with its own funding and equipment, in addition to sponsoring a new Afghan mountain brigade operating in Badakhshan province near the China-Afghanistan border. Ahmad Khalil argues that China further involving itself is inevitable, as it could consider expanding CPEC projects into Afghanistan, or integrating Afghanistan in a post-peace scenario further into the Chinese economy. He also says that China had to step into talks “for the benefit of all three countries” and is essentially gearing up to play an even bigger role, matching the growth of its economic ventures. …(i) the changing character of insurgency; (ii) Taliban’s ability to produce an enduring narrative of anti-Americanism and weak government; (iii) role of the external powers which contributed to its destabilizing capacities; (iv) its nexus with armed opposition groups and organized crime networks in Afghanistan which extended its reach and ability to generate resources; and (v) lack of unity of effort among the coalition partners as well as the shortcomings among the Afghan National Security Forces (ANSFs) to defeat the insurgency. In particular, China could address items (ii), (iii), and (v) in a way that other potential arbiters could not as effectively. China never invaded or occupied Afghanistan, and if China were the main architect behind any peace-building initiatives, the Taliban could no longer rely on that robust narrative. The Taliban uses an anti-American, anti-infidel narrative to sustain its constant campaigns against Afghan and foreign targets on Afghan soil. According to D’Souza, “That the Americans have illegally invaded an Islamic land and no peace can return to the land until Afghanistan is purged completely of American presence has remained the oft-repeated rationale for Taliban’s stated counter-violence.” China stepping in to the peace process would challenge the assumption: China never invaded or occupied Afghanistan, and if China were the main architect behind any peacebuilding initiatives, the Taliban could no longer rely on that robust narrative. Next, the influence of foreign powers such as Pakistan and Iran has given the Taliban the opportunity to take advantage of instability in Afghanistan, and China could work to allay that by using its own economic and diplomatic might to align Pakistan and Iran with its end goals in Afghanistan. China thus acts as a veritable counterweight to U.S. initiatives to counter extremism in Afghanistan and serves to undermine the peace process no matter how invested China is in preventing the spread of terrorism. Furthermore, Vinay Kaura argues through the Middle East Institute that in order for China-led peace efforts to be effectual, another dimension that needs to be more synchronized is Afghan and Pakistani economic objectives, which currently diverge rather than align. Afghan industries have been attempting to move away from their dependency on Pakistan, and the opening of Chabahar port and other airways with India have been evidence of this change. Overall, though, Kaura’s analysis does not include new layers of Chinese influence in Pakistan, particularly through the growing China-Pakistan Economic Corridor. As China’s hand to play in Pakistani economic prosperity and energy revitalization expands, so too will its influence over Pakistani governmental and military decision-making, even to an extent that can overcome some of Pakistan’s resistance in toning down its accommodations for extremist groups in Afghanistan. 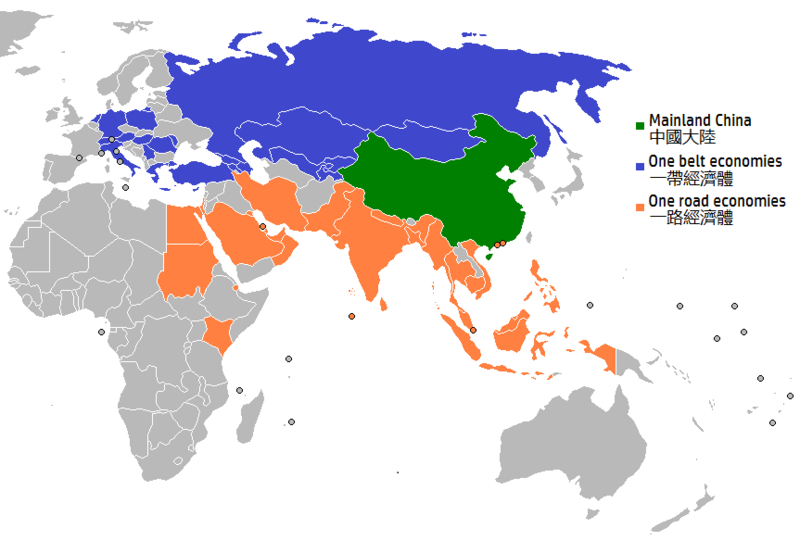 Similarly, China’s geopolitical influence and its considerably larger capacity to leverage diplomatic, military and developmental aid makes it a much more attractive ally to have than India; should China be able to mediate between Afghanistan and Pakistan and adequately alleviate the security threats that Afghanistan currently perceives to be emanating from its Pakistani border, Afghani economic goals would surely then better align with Pakistan’s, and China would be able to lock in a strategic axis for itself to depend on in the future. In fact, more recently on September 4, 2017, China issued the Xiamen Declaration, which accused several groups of inciting violence in its Westernmost borders, and the Declaration included two groups based within Pakistan: Lashkar-e-Taiba and Jaish-e-Mohammed. As always, the proposal included ETIM, reinforcing China’s regional security priorities above all. The Declaration demonstrated to Pakistan that China was not above straining the “all-weather friendship” if it meant that China could accomplish its security goals, as China considers ETIM to be the “most direct and realistic security threat.” As Chinese ventures expand and its involvement in Pakistan and Afghanistan and other Central Asian countries deepen, the government will want to ensure that these ventures can proceed without risk of harm. Several examples exist so far that show other states courting China’s approval or help by changing its behavior with regards to extremist groups. For example, Afghanistan in 2015 arrested several Chinese Uighur militants and handed them back to the Chinese government. This move coincided with the restarting of peace talks with the Taliban, and Afghani officials conducted these operations in order to improve the possibility of China acting on their behalf and reining in Pakistan to accommodate Afghani security and political priorities in the peace process. China will soon need to expect the same steps from Pakistan in order to be a meaningful contributor to peace. China’s strategy for the past ten years has involved the use of economic means to cultivate other countries’ stakes in maintaining relationships with China, and then predicate those good relationships upon the countries’ minding the Chinese party line. For example, Cambodia in 2012 kept the 45th ASEAN conference from issuing a communique for the first time ever due to China’s pressure upon the country, as it tasked Cambodian representatives to omit any mention of the South China Sea and China’s rivalry with the Philippines over certain water areas, such as the Scarborough Shoal. Similarly, China began a series of escalating economic pressures over the Philippine government’s resolve to stay within the Scarborough Shoal in spite of China contesting its claim. Shipments of bananas and other fruit from the Philippines were blocked or delayed through excess inspections, crippling the exporter, as 30% of all Filipino bananas were exported to China. Businesses in the Philippines pressured the government to take a softer stance on Chinese encroachment upon their waters, and in the end, China was able to remain in the shoal, placing ships strategically to block Filipino reentry into the Shoal. As China has demonstrated in the Asia-Pacific, after deepening economic ties, the Chinese government would not be afraid to capitalize upon these trade advantages in accomplishing security goals. Furthermore, as China’s priorities shift from the Asia-Pacific front to the Westward front, one would expect China to follow the same protocol when dealing with its neighborhood allies with its territorial integrity and security at stake in Xinjiang. For dealing with Iranian influence, China and Iran have a strong economic bond — for instance, in 2016, the powers agreed to ramp up their trade to $600 billion after the lifting of international sanctions — that the Chinese government could leverage for the benefit of Afghanistan. Iran originally entered the Afghan conflict as a force protective of the Hazara Shia minority, but the anti-Americanism in the Taliban’s rhetoric has forced Iran over time to realign itself more closely with the Taliban. In recent years, Iran allowed the training of Taliban fighters within its borders and also supplied weapons to the insurgency out of concern that the U.S. occupation of Afghanistan would turn permanent. China as a peace-broker would be able to curb Iran’s involvement on behalf of the Taliban. Overall, through China taking a stronger stance in favor of peace talks and being the main architect behind them — in lieu of the U.S. — the Taliban would lose its ability to capitalize on foreign powers’ destabilization of Afghanistan and would then be deprived of some of its power. As compared with the United States, China has regional “skin in the game” with regards to a direct threat from the Eastern Turkistan Islamic Movement and other radical elements involved with the various branches of the Taliban in Afghanistan and Pakistan. Its security interests, especially as its Westernmost provinces become further developed and it expands its OBOR investments in Pakistan and Afghanistan, have increasingly aligned with that of the Afghan government’s in resolving the Afghan conflict through peace talks, reconciling with the Taliban, and ultimately stabilizing Afghanistan through the removal of foreign destabilizing pressure. China has also been able to provide meaningful support and assistance to Afghan National Security Forces that contributes to an “Afghan-led, Afghan-owned” state-building and peace-making stratagem, unlike the United States. During the U.S. intervention, due to the political rationale going into maintaining an invasion and subsequent occupation, development was only seen as a subsidiary goal to securitization and fighting terrorism in the region. The coalition forces did not meaningfully strive to build up local alternatives and local partners, and that contributed to the lack of perceived legitimacy for the governments both local and national that the coalition set up in its wake. The environment of a prolonged occupation inculcated a system of priorities that would, in the long-term, not do well by the Afghans themselves. China has both rhetorically and tangibly committed itself to the insurance of Afghan independence, particularly in the vein of dealing with its own security threats, and the Chinese government intends to continue building Afghan capacity through aid and training until it can do so. While securitization figures significantly in the reasoning for China’s involvement with the peace process to begin with, China will definitely not need to sustain security for a foreign occupation apparatus, and its strategic interests coincide more neatly with the development of Afghanistan for its own sake, rather than as a secondary means towards security. Because of OBOR as well as the stakes that numerous Chinese companies have in mineral deposits all along Afghanistan, the end of the conflict and Afghan economic development and self-sufficiency prove key for Afghan participation in such endeavors. These driving aspects of Chinese military aid show through in the building up of Afghan capacity such as in the building of the Badakhshan base, which China funded but Afghanistan will physically build and staff. China has in the past provided technological and weapons-related support to the Afghan National Army. Afghan National Security Advisor Haneef Atmar recently visited China to ask for support in creating a “Mountain Brigade,” made of Afghan soldiers, with China providing training and weaponry for the patrol. There exists a degree of trust between the Afghan government and China that does not seem to be mirrored in the level of trust between the Afghan government and America’s Trump administration. Zhao Huasheng wrote in the Carnegie Middle East Center’s publication: “China has always emphasized the principles that Afghanistan belongs to the Afghan people, not to any other country, and that the Afghan people should be responsible for affairs in their country.” Overall, China has emphasized that it does not intend to supply its own troops for any reason in Afghanistan. Its regional proximity to Afghanistan ensures that its troops could intervene in a disaster-type scenario, but China will not be sustaining an occupation structure in Afghanistan and will avoid directly intervening in Afghanistan at all costs. Thus, the quality of military aid given by China directly to the Afghan National Army is buoyed by necessity: the Afghan National Army will still be the primary force responsible for maintaining Afghan security. Ultimately, Chinese involvement with the peace process could work to address the Taliban’s appeal to the common people through providing an alternative route to peace that circumvents the Taliban’s anti-American and anti-invader message, curbing the destabilizing influence of key foreign actors through diplomatic and nonviolent means due to China’s functional ties with Pakistan and Iran, and providing aid that contributes to an Afghan-owned peace process with a robust Afghan army. Through addressing these issues, the Taliban would be more inclined to believe that its power-based legitimacy would be more likely to fail should it continue to hold out in a military confrontation, and so would be willing to come to the table for renewed peace talks involving Afghanistan, Pakistan, and China. Other diplomatic inroads have been made in Afghanistan of late. In 2018, China and India jointly trained 10 Afghan diplomats at the India Foreign Service Institute in New Delhi. This collaborative act could signal a shift in major powers’ perception of the strategic importance of Afghanistan, moving away from seeing it as a zero-sum political arena and more as demonstrating the need for cooperation to resolve the conflict. Also, on January 10 of this year, Afghanistan’s national security advisor Hamdullah Mohib met with Wang Yi, China’s foreign minister in order to discuss the further stability of Afghanistan. This report comes at the same time as President Trump’s deliberation on whether or not to pull out half of the 14,000 troops in Afghanistan. China may be gearing up for a more long-term role in the country in response to the ebb of U.S. influence. So do all things point to China being the panacea of Afghanistan’s ills? No, due to its “narrow and superficial” approach, according to Dr. Sudhra Ramachandran. Although China’s actions may provide a route to an alleviation of immediate violent conflict, China has not taken an interest in addressing underlying causes of insecurity beyond securing its own borders from the threat posed by jihadists or creating conditions for its BRI projects to succeed. But in the meantime, China has now created for itself a number of potential avenues to further peace efforts between the Taliban, Afghanistan, and Pakistan. Previously, China’s close ties to Pakistan were seen as a liability or a bias that would keep it from being a meaningful partner for peace, as in the past china has tended to shield Pakistan from criticism. However, China’s security goals naturally align with those of the Afghan government, in that China does not want extremist elements spreading over into Xinjiang. These priorities have now become paramount: China has heightened its industrial emphasis in its Western cities in order to make them hubs of new trade and infrastructure projects, which span out into the rest of the world through the BRI. Moreover, China has built up a solid economic base from which to influence Pakistani decision-making through the China-Pakistan Economic Corridor. Though China and Pakistan have always counted on each other as friends, the dynamics on the ground have taken on a brand new, never-before-seen-dynamic due to China’s inexorable involvement in Pakistani affairs, and its raised emphasis on ensuring security on the ground in order to safeguard its numerous projects and economic interests. As the China-Pakistan relationship takes on this new dimension, China will increasingly have the proper wherewithal to steer Pakistani support away from the extremist factions by also guaranteeing in Afghanistan that India will never be able to get a meaningful geopolitical foothold and further distress Pakistan. China is ultimately here to stay. From the U.S perspective, this comes as a further blow to its ebbing influence in the region stemming from its failed state-building operations in Afghanistan and Iraq. China overall is uniquely well-suited for this new role as far as peace-brokering goes, given its positive relationships with all significant parties in regional peace initiatives, the level of trust between China and Afghanistan and China and Pakistan, and its growing soft power in the region. About the Author: Elisabeth Siegel is a junior at Yale majoring in global affairs. She is the Editor-in-Chief of the Yale Review of International Studies and the founder of the Yale International Policy Competition. She specializes in Middle East affairs, China-Middle East relations, and conflict resolution. Last summer, she interned with Albright Stonebridge Group’s Middle East/North Africa division. In her free time, she writes short fiction and is the Art Director of Sine Theta Magazine. Ali, Samran. “China Factor in Afghan Peace.” The Nation, April 16, 2018. Accessed May 2, 2018. https://nation.com.pk/16-Apr-2018/china-factor-in-afghan-peace. Amini, Mariam. “China Gets an All-Clear from the Taliban to Mine for Copper in Afghanistan.” CNBC, December 16, 2016. 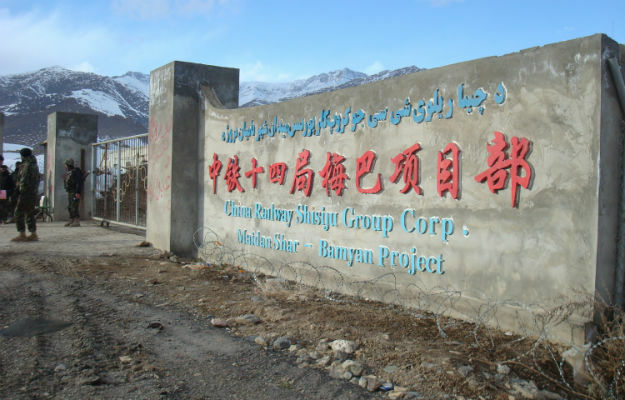 Accessed May 3, 2018. https://www.cnbc.com/2016/12/16/china-cleared-by-taliban-to-mine-for-copper-in-afghanistan.html. Banerjee, Dipankar. Pakistan’s Nuclear Proliferation and Its Impact on International and Regional Security. Research report no. 55. NBR Special Report. N.p. : National Bureau of Asian Research, 2016. Bauke, Nicole. “Now China’s Helping to Build a Military Base in Afghanistan.” Military Times, February 2, 2018. Accessed May 3, 2018. https://www.militarytimes.com/news/2018/02/02/now-chinas-helping-to-build-a-military-base-in-afghanistan/. Bhatnagar, Aryaman, and C. Raja Mohan. India-Pakistan Relations and Regional Stability. Research report no. 55. N.p. : National Bureau of Asian Research, 2016.
Cooper, Courtney. “Why the Time Is Right to Talk to the Taliban.” Council on Foreign Relations. Last modified November 9, 2017. Accessed April 30, 2018. https://www.cfr.org/article/why-time-right-talk-taliban. Downs, Erica S., and Suzanne Maloney. “Getting China to Sanction Iran.” Brookings Institution. Last modified February 23, 2011. Accessed May 3, 2018. https://www.brookings.edu/articles/getting-china-to-sanction-iran/. D’Souza, Shanthie Mariet. “Taliban: The Rebels Who Aspire to Be Rulers.” Journal of Asian Security and International Affairs 3, no. 1 (2016): 20-40. http://journals.sagepub.com/doi/pdf/10.1177/2347797015626043. Du, Eddie. “China and the Taliban: Some Facts.” Edourdoo (blog). Entry posted June 7, 2003. Accessed April 29, 2018. http://duxuezhong.blogspot.com/2013/06/china-and-taliban-some-facts.html. Fair, C. Christine. Pakistan’s Internal Security Environment. Research report no. 55. N.p. : National Bureau of Asian Research, 2016. Felbab-Brown, Vanda. “Pakistan’s Relations with Afghanistan and Implications for Regional Politics.” Brookings Institution. Last modified May 14, 2015. Accessed April 26, 2018. https://www.brookings.edu/research/pakistans-relations-with-afghanistan-and-implications-for-regional-politics/. Ferdinand, Peter. “Westward Ho—the China Dream and ‘One Belt, One Road’: Chinese Foreign Policy under Xi Jinping.” International Affairs 92, no. 4 (July 1, 2016): 941-57. Accessed May 2, 2018. https://academic.oup.com/ia/article/92/4/941/2688105. Glaser, Bonnie S. “China’s Coercive Economic Diplomacy.” The Diplomat, July 25, 2012, Features. Accessed May 2, 2018. https://thediplomat.com/2012/07/chinas-coercive-economic-diplomacy/. Gul, Ayaz. “China Delivers First Batch of Military Aid to Afghanistan.” Voice of America News (Islamabad), July 3, 2016, Asia. 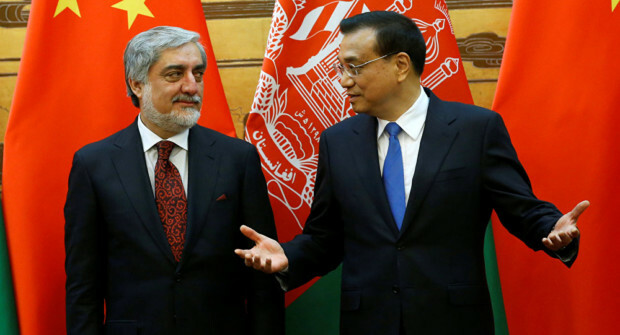 Accessed May 3, 2018. https://www.voanews.com/a/china-military-aid-afghanistan/3402178.html. ———. “Taliban Confirms Afghan Peace Meetings with Pakistan, China, Others.” Voice of America News (Islamabad), January 24, 2018. Accessed April 27, 2018. https://www.voanews.com/a/taliban-working-to-resolve-afghan-war/4224199.html. Hamzah, B. A. “Alleviating China’s Malacca Dilemma.” Institute for Security and Development Policy. Last modified March 13, 2017. Accessed May 3, 2018. http://isdp.eu/alleviating-chinas-malacca-dilemma/. Hsu, Sara. “China’s Relations With Iran: A Threat to the West?” The Diplomat, January 27, 2016, Pacific Money. Accessed May 2, 2018. https://thediplomat.com/2016/01/chinas-relations-with-iran-a-threat-to-the-west/. Kaura, Vinay. “China, US Differ on Road to Peace in Afghanistan.” Middle East Institute. Last modified January 9, 2018. Accessed May 3, 2018. http://www.mei.edu/content/article/china-us-differ-road-peace-afghanistan. Khalil, Ahmad Bilal. 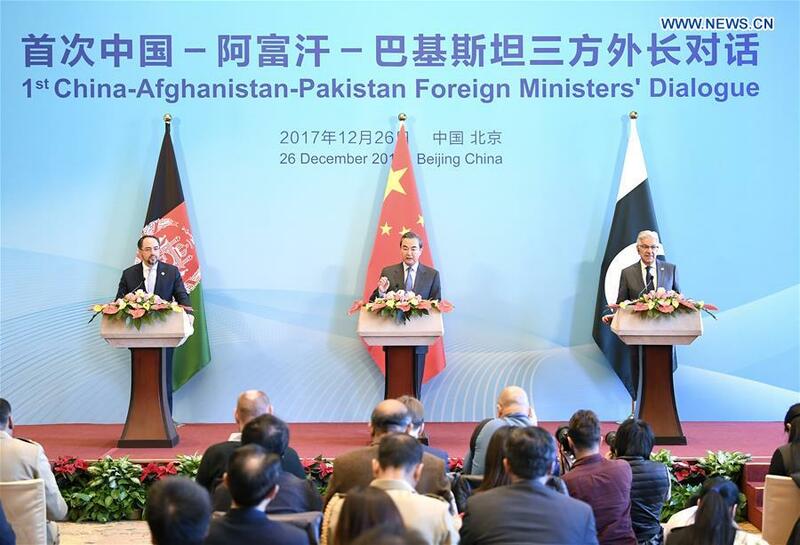 “The History of Chinese Mediation between Afghanistan and Pakistan.” The Diplomat, January 5, 2018. Accessed April 27, 2018. https://thediplomat.com/2018/01/the-history-of-chinese-mediation-between-afghanistan-and-pakistan/. News Desk. “Pakistan, Afghanistan Agree to Operationalise APAPPS.” Pakistan Today (Kabul), April 8, 2018, National. Accessed May 2, 2018. https://www.pakistantoday.com.pk/2018/04/08/pakistan-afghanistan-agree-to-operationalise-apapps/. Pantucci, Raffaello. “China’s Afghan Dilemma.” Survival: Global Politics and Strategy 52, no. 4 (2010): 21-27. doi:10.1080/00396338.2010.506813. Pradhan, Ramakrushna. “The Rise of China in Central Asia: The New Silk Road Diplomacy.” Fudan Journal of the Humanities and Social Sciences 11, no. 1 (March 2018): 9-29. https://link.springer.com/content/pdf/10.1007%2Fs40647-017-0210-y.pdf. Putz, Catherine. “Can China Help Mediate between Afghanistan and Pakistan?” The Diplomat, June 13, 2017, The Pulse. Accessed May 3, 2018. https://thediplomat.com/2017/06/can-china-help-mediate-between-afghanistan-and-pakistan/. Ranade, Jayadeva. The National Bureau of Asian Research. Research report no. 55. NRB Special Report. National Bureau of Asian Research, 2016. Accessed May 3, 2018. http://www.nbr.org/publications/specialreport/pdf/sr55_mapping_pakistan_february2016.pdf. Rank, David. “For an Afghan Peace, Work with China.” United States Institute of Peace. Last modified March 15, 2018. Accessed April 27, 2018. https://www.usip.org/publications/2018/03/afghan-peace-work-china. Reuters Staff. “Afghanistan Signs Major Oil Deal with China’s CNPC.” Reuters (Kabul), December 28, 2011, Middle East & North Africa. Accessed May 3, 2018. https://www.reuters.com/article/afghanistan-cnpc/update-1-afghanistan-signs-major-oil-deal-with-chinas-cnpc-idUSL3E7NS40J20111228?feedType=RSS&feedName=rbssEnergyNews&utm_source=feedburner&utm_medium=feed&utm_campaign=Feed%3A+reuters%2FUSenergyNews+(News+%2F+US+%2F+Energy). Ruttig, Thomas, and Kate Clark. ““AnAattempt to Wipe out History”: The Destruction of the Bamian Buddha Colossi in 2001.” Afghanistan Analysts Network. Last modified March 1, 2015. Accessed May 3, 2018. https://www.afghanistan-analysts.org/an-attempt-to-wipe-out-history-the-destruction-of-the-bamian-buddha-colossi-in-2001/. Shalizi, Hamid. “Afghans Arrested Chinese Uighurs to Aid Taliban Talks Bid: Officials.” Reuters, February 20, 2015, World News. Accessed April 30, 2018. https://www.reuters.com/article/us-afghanistan-taliban-china/afghans-arrested-chinese-uighurs-to-aid-taliban-talks-bid-officials-idUSKBN0LO18020150220. Small, Andrew. The China-Pakistan Axis: Asia’s New Geopolitics. Oxford [u.a. ]: Oxford Univ. Press, 2015. South China Morning Post. “China Can Help Bring Peace to Afghanistan.” South China Morning Post. Last modified January 2, 2018. Accessed April 27, 2018. http://www.scmp.com/comment/insight-opinion/article/2126431/china-can-help-bring-peace-afghanistan. Sun, Yun. “March West: China’s Response to the U.S. Rebalancing.” Brookings Institution. Last modified January 31, 2013. Accessed May 3, 2018. https://www.brookings.edu/blog/up-front/2013/01/31/march-west-chinas-response-to-the-u-s-rebalancing/. TOLOnews.com. “NSA Asks China to Help Establish a ‘Mountain Brigade’.” TOLO News, April 21, 2018, Afghanistan. Accessed May 3, 2018. https://www.tolonews.com/index.php/afghanistan/nsa-asks-china-help-establish-%E2%80%98mountain-brigade%E2%80%99. Umarov, Akram. “Assessing China’s New Policy in Afghanistan.” Central Asian Affairs 4 (2017): 384-406. Brill. Wang, Shida. “Trilateral Initiatives Focusing on Afghanistan: US-China-Pakistan and Russia-China-Pakistan.” Triangular Formations in Asia Genesis, Strategies, Value Added and Limitations, September 7, 2017. Accessed April 27, 2018. https://www.swp-berlin.org/fileadmin/contents/products/arbeitspapiere/BCAS2017_Paper_Wang_Shida.pdf. Xinhua. “SCO Accepts Afghanistan as Observer, Turkey Dialogue Partner.” English People CN. Last modified June 7, 2012. Accessed May 3, 2018. http://en.people.cn/90883/7839137.html. Xu, Beina, Holly Fletcher, and Jayshree Bajoria. “The East Turkestan Islamic Movement (ETIM).” Council on Foreign Relations. Last modified September 4, 2014. Accessed May 2, 2018. https://www.cfr.org/backgrounder/east-turkestan-islamic-movement-etim. Zhai, Keith. “China Steps up to Broker Peace in Afghan-Pakistan Conflict.” Bloomberg, December 26, 2017. Accessed April 27, 2018. https://www.bloomberg.com/news/articles/2017-12-26/china-holds-meeting-to-broker-peace-in-afghan-pakistan-conflict. Zhao, Huasheng. “What Is behind China’s Growing Attention to Afghanistan?” Carnegie Middle East Center. Last modified March 8, 2015. Accessed May 3, 2018. https://carnegie-mec.org/2015/03/08/what-is-behind-china-s-growing-attention-to-afghanistan-pub-59286#evolution. Zhu, Lingqing. “West China Takes Lead in Disposable Income Growth in H1.” China Daily, August 8, 2017. Accessed May 3, 2018. http://www.chinadaily.com.cn/business/2017-08/08/content_30372834.htm. Peter Ferdinand, “Westward Ho—the China Dream and ‘One Belt, One Road’: Chinese Foreign Policy under Xi Jinping,” International Affairs 92, no. 4 (July 1, 2016), accessed May 2, 2018, https://academic.oup.com/ia/article/92/4/941/2688105. Yun Sun, “March West: China’s Response to the U.S. Rebalancing,” Brookings Institution, last modified January 31, 2013, accessed May 3, 2018, https://www.brookings.edu/blog/up-front/2013/01/31/march-west-chinas-response-to-the-u-s-rebalancing/. B. A. Hamzah, “Alleviating China’s Malacca Dilemma,” Institute for Security and Development Policy, last modified March 13, 2017, accessed May 3, 2018, http://isdp.eu/alleviating-chinas-malacca-dilemma/. Jayadeva Ranade, The National Bureau of Asian Research, research report no. 55, NRB Special Report (National Bureau of Asian Research, 2016), 108, accessed May 3, 2018, http://www.nbr.org/publications/specialreport/pdf/sr55_mapping_pakistan_february2016.pdf. Catherine Putz, “Can China Help Mediate between Afghanistan and Pakistan?,” The Diplomat, June 13, 2017, The Pulse, accessed May 3, 2018, https://thediplomat.com/2017/06/can-china-help-mediate-between-afghanistan-and-pakistan/. Dipankar Banerjee, Pakistan’s Nuclear Proliferation and Its Impact on International and Regional Security, research report no. 55, NBR Special Report (n.p. : National Bureau of Asian Research, 2016), 164. Marcelo Duhalde, Adolfo Arranz, and Marco Hernandez, “China’s Super Link to Gwadar Port,” South China Morning Post, Belt and Road Initiative, accessed May 4, 2018, http://multimedia.scmp.com/news/china/article/One-Belt-One-Road/pakistan.html. Duhalde, Arranz, and Hernandez, “China’s Super,” Belt and Road Initiative. Vanda Felbab-Brown, “Pakistan’s Relations with Afghanistan and Implications for Regional Politics,” Brookings Institution, last modified May 14, 2015, accessed April 26, 2018, https://www.brookings.edu/research/pakistans-relations-with-afghanistan-and-implications-for-regional-politics/. C. Christine Fair, Pakistan’s Internal Security Environment, research report no. 55 (n.p. : National Bureau of Asian Research, 2016), 48. Mariam Amini, “China Gets an All-Clear from the Taliban to Mine for Copper in Afghanistan,” CNBC, December 16, 2016, accessed May 3, 2018, https://www.cnbc.com/2016/12/16/china-cleared-by-taliban-to-mine-for-copper-in-afghanistan.html. Reuters Staff, “Afghanistan Signs Major Oil Deal with China’s CNPC,” Reuters (Kabul), December 28, 2011, Middle East & North Africa, accessed May 3, 2018, https://www.reuters.com/article/afghanistan-cnpc/update-1-afghanistan-signs-major-oil-deal-with-chinas-cnpc-idUSL3E7NS40J20111228?feedType=RSS&feedName=rbssEnergyNews&utm_source=feedburner&utm_medium=feed&utm_campaign=Feed%3A+reuters%2FUSenergyNews+(News+%2F+US+%2F+Energy). Eddie Du, “China and the Taliban: Some Facts,” Edourdoo (blog), entry posted June 7, 2003, accessed April 29, 2018, http://duxuezhong.blogspot.com/2013/06/china-and-taliban-some-facts.html. Thomas Ruttig and Kate Clark, ““An Attempt to Wipe out History”: The Destruction of the Bamian Buddha Colossi in 2001,” Afghanistan Analysts Network, last modified March 1, 2015, accessed May 3, 2018, https://www.afghanistan-analysts.org/an-attempt-to-wipe-out-history-the-destruction-of-the-bamian-buddha-colossi-in-2001/. Courtney Cooper, “Why the Time Is Right to Talk to the Taliban,” Council on Foreign Relations, last modified November 9, 2017, accessed April 30, 2018, https://www.cfr.org/article/why-time-right-talk-taliban. Ayaz Gul, “Taliban Confirms Afghan Peace Meetings with Pakistan, China, Others,” Voice of America News (Islamabad), January 24, 2018, accessed April 27, 2018, https://www.voanews.com/a/taliban-working-to-resolve-afghan-war/4224199.html. 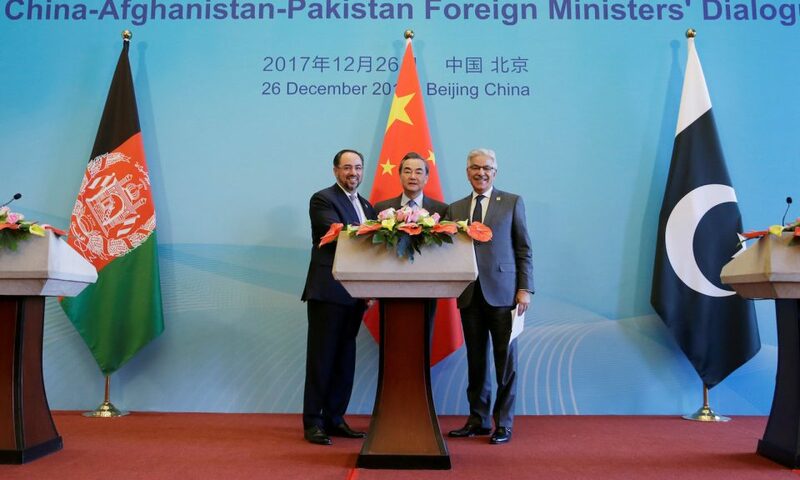 Ahmad Bilal Khalil, “The History of Chinese Mediation between Afghanistan and Pakistan,” The Diplomat, January 5, 2018, accessed April 27, 2018, https://thediplomat.com/2018/01/the-history-of-chinese-mediation-between-afghanistan-and-pakistan/. Shanthie Mariet D’Souza, “Taliban: The Rebels Who Aspire to Be Rulers,” Journal of Asian Security and International Affairs 3, no. 1 (2016): 23, http://journals.sagepub.com/doi/pdf/10.1177/2347797015626043. David Rank, “For an Afghan Peace, Work with China,” United States Institute of Peace, last modified March 15, 2018, accessed April 27, 2018, https://www.usip.org/publications/2018/03/afghan-peace-work-china. Hamid Shalizi, “Afghans Arrested Chinese Uighurs to Aid Taliban Talks Bid: Officials,” Reuters, February 20, 2015, World News, accessed April 30, 2018, https://www.reuters.com/article/us-afghanistan-taliban-china/afghans-arrested-chinese-uighurs-to-aid-taliban-talks-bid-officials-idUSKBN0LO18020150220. Sara Hsu, “China’s Relations With Iran: A Threat to the West?,” The Diplomat, January 27, 2016, Pacific Money, accessed May 2, 2018, https://thediplomat.com/2016/01/chinas-relations-with-iran-a-threat-to-the-west/. Erica S. Downs and Suzanne Maloney, “Getting China to Sanction Iran,” Brookings Institution, last modified February 23, 2011, accessed May 3, 2018, https://www.brookings.edu/articles/getting-china-to-sanction-iran/. Astri Suhrke, When More Is Less: The International Project in Afghanistan (New York: Columbia University Press, 2011), 57. Nicole Bauke, “Now China’s Helping to Build a Military Base in Afghanistan,” Military Times, February 2, 2018, accessed May 3, 2018, https://www.militarytimes.com/news/2018/02/02/now-chinas-helping-to-build-a-military-base-in-afghanistan/. Ayaz Gul, “China Delivers First Batch of Military Aid to Afghanistan,” Voice of America News (Islamabad), July 3, 2016, Asia, accessed May 3, 2018, https://www.voanews.com/a/china-military-aid-afghanistan/3402178.html. TOLOnews.com, “NSA Asks China to Help Establish a ‘Mountain Brigade’,” TOLO News, April 21, 2018, Afghanistan, accessed May 3, 2018, https://www.tolonews.com/index.php/afghanistan/nsa-asks-china-help-establish-%E2%80%98mountain-brigade%E2%80%99. Huasheng Zhao, “What Is behind China’s Growing Attention to Afghanistan?,” Carnegie Middle East Center, last modified March 8, 2015, accessed May 3, 2018, https://carnegie-mec.org/2015/03/08/what-is-behind-china-s-growing-attention-to-afghanistan-pub-59286#evolution.